Welcome to Happy Friday Links where I share my favourite reads of the week. It's great to hear that some of you are enjoying my recent blog finds - I'm all for championing less well known blog talent as you may have gleaned (and if it's from the UK and has a minimalist theme that's an added bonus but not a criteria). There still exists a generous and authentic spirit of blogging on the internet, I believe. It's very much present although not so easy to find these days and I fear some may have lost their way. Wonderful writing, inspirational stories, wellbeing tips, creative nuggets and lifestyles/voices that transcend the commercial sphere. It's all out there. I do hope you find something to interest and inspire you here. How not to snack by Fiona from How to be chic. Some useful tips to keep that snacking habit in check. What have you done today? from Happening upon Happiness is a good reminder to value the quiet moments of the day and to put health and happiness back on our to-do lists. A Quest for Meaning from Florie at The Nife en l'Air is full of hope and inspiration for a rich life that beckons beyond consumerism. Releasing the pause button by Nancy at between the shifts (yes she's a nurse) is for you if you're about to step back on the hamster wheel of work after a holiday. Get planning those September adventures! How to tie in your sweet peas is a video that's still useful in my tiny and north facing garden. If your sweet peas are over there's tons more gardening tips and recipe videos on Sarah Raven's YouTube channel. How have I survived without this resource! the colour collaborative: dress from Annie Cholewa was a delightful find this week. Annie shares her wealth of knowledge and skilled eye in appreciating The Arnolfini Portrait by Jan van Eyck. Read the comments from those of us who clicked on the enlarged image and made our own discoveries. Also visit the other bloggers who write on the subject of dress for a fashion fest (listed at the bottom of Annie's post). Oh my goodness! I want to live in Bridgnorth! What a beautiful village! 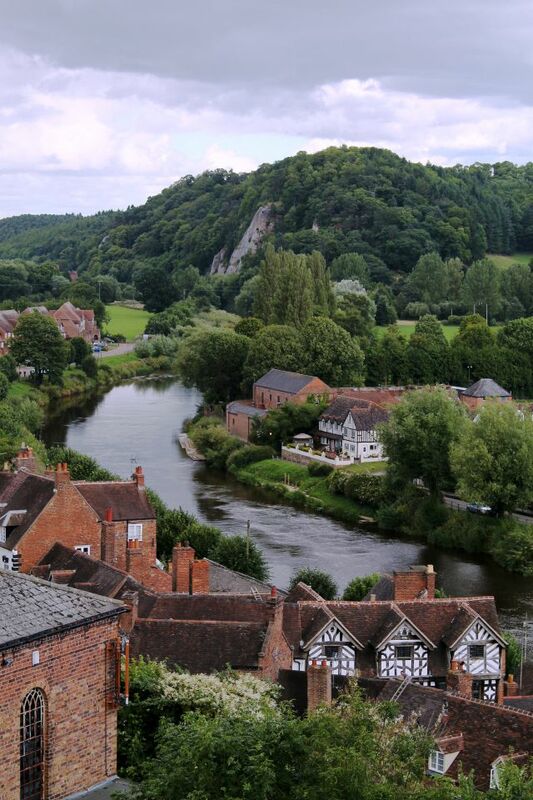 After typing that, I googled Bridgnorth and realised it's a town I remember from a really good episode of Time Team! Thank you so much for the link Claire, and your sweet words. I've enjoyed all your posts this summer, I fear though that I've been lazy about commenting. Bridgnorth, one of our favourite places and only an hour or so away from here ... you've reminded me how long it is since we paid a visit. Hi Annie. You're most welcome and Bridgnorth has something special, I agree!